For some strange reason, American women feel that they need to bring sacrifices to the Goddess of fertility by banning wine, good cheese, smoked meats, rare steaks, and sushi from their diet. The reason I am writing this post, is that cooked fish has recently joined this echelon of forbidden foods due to the threat of mercury harming the fetus. After Andrea from Rookie Cookery asked me to comment on the subject, I set out on a research project to separate fact from media hype. I even got my husband, a research scientist well-versed in statistical methods, to aid in the investigation. The event that made mercury into a “hot button” issue was the Minamata Disaster in Japan. From 1932 to 1968, Chisso Corporation dumped an estimated 27 tons of mercury compounds into Minamata Bay . By eating the fish from the local waters, many inhabitants of that area (including many unborn babies) got severe mercury poisoning resulting in brain damage and sometimes even death. There is no dispute that high amounts of mercury are dangerous to human health. The question is how much is too much? To find the answer, we dug through a good number of articles. Most just made big scary statements like 1 in 6 American women puts her baby at risk, and 630,000 infants are born every year with unsafe mercury levels . But it wasn’t until we got to the FDA’s site that we started getting some real facts. Here is a diagram showing the level of mercury in mother's blood in 3 recent studies . You see the first two large bars. That’s the average amount of mercury in mother’s blood in parts per million (ppm) of two large-scale studies. That’s a lot of mercury compared to the study done in US. But even at those high levels of mercury, the results from the two island studies were inconclusive. 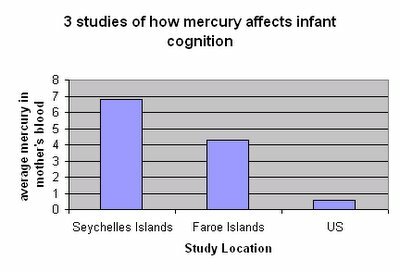 Faroe Island study found that this level of mercury had a negative effect on infant cognition; the Seychelles Island study found no effect. The study in US was done by Harvard Medical School on 135 mothers and their babies in Boston area. The average level of mercury in this group was only 0.55ppm. Did those women eat fish? Yes they did! The average fish consumption during pregnancy was 1.2 servings per week. Since I eat way more than 1.2 servings of fish per week, my next question was “How much does each weekly serving raise my mercury level?” According to the HMS study, each additional weekly serving of fish increases your mercury level by 0.17ppm. So even if you were to eat fish every day, it would be practically impossible for you to reach the mercury levels of the two island studies. The Boston study found that mother’s fish intake was positively correlated with infant cognition. While fish contains mercury, which is negatively correlated with infant cognition, it also contains “nutrients like iron, vitamin E, selenium, and long-chain n-3 polyunsaturated fatty acids that may benefit brain development.” Here is an excerpt from the study that explains risk benefit trade-off. Mercury levels vary among different fish species. In general, white meat fish such as cod and haddock tend to have lower mercury levels but also lower levels of long-chain n-3 fatty acid, whereas dark meat fish such as swordfish, mackerel, and other large long-lived predatory fish, tend to contain both more mercury and more n-3 fatty acids. Because mercury and n-3 fatty acids often travel together, it may be difficult to isolate the opposing influences of the two on child cognition. Small fatty fish, such as sardines contain relatively more fatty acids with less mercury. But since no data is currently available on how different fish effect infant cognition, the study suggests that women eat a variety of fish to maximize the benefits and minimize the risks. Keep in mind that I am not a doctor or a scientist, but here are my 2 cents on this polarizing debate. Fish does not make a good sacrifice to the goddess of fertility. In fact, avoiding fish may be detrimental to unborn children. If you are really looking to ban something, consider fast food. Meanwhile, if you want to do something good for your health and your palate, go to your local fish market and start exploring beyond salmon. Note: this post was updated on Feb. 12, 06. Fantastic post! In fact I would already nominate this as one of the best blog posts of the year. I too have often wondered what is the truth about mercury. I love fish, but have heard many of the "scary" stories about eating too much fish. Thank you for helping to separate fact from fiction. Most of the literature I've read suggest simply to avoid large predator fishes like tuna, marlin and shark. That leaves plenty of options! Yes, there are definitely lots of options that are not high in mercury and still good for you. The only 4 fish that FDA points out as particularly high are swordfish, shark, tilefish, and king mackerel (not to be confused with regular mackerel). Light canned tuna is actually fine, but tuna steaks are on the high side(though not as high as the swordfish, etc). Still, it seems questionable to me that one must avoid ALL swordfish while being pregnant. Sure, eating it every week might not be a good idea, but if you really feel like swordfish once in a while, I don't see how that can cause any harm. It's not like it's loaded with mercury (like we all would like to believe). It just has 3-5 times the mercury of something like salmon. But FDA doesn't like telling people that they should eat something in moderation. Most people don't like to think about what they eat and when they eat it. They want to eat something either all the time, or not at all. I guess that's why diets that suggest no fat, no carb, or no whatever are so popular. I'll bet other sources of Mercury, such as dental fillings, are a much more potent hazard than fish--or at least, I hope so! Thanks for the research on all our behalf. I have never modified my fish consumption based on fears of mercury contamiantion, (I eat all the fish I want), but I do have strong concerns about protecting our environment from all toxins. What a great post Helen! Very interesting, something I have been wondering about for a while. Well done. I just ran into an old acquaintance who told me that she had been very ill with a mysterious illness, had to quit her job and was about to move into assisted living. She had a dream about her teeth and called up her doctor the next morning and asked to be tested for mercury. That indeed was the problem. She had her dental work removed and underwent what for her was a painful chelation process. You'll never guess what it is--cilantro!--and she hates it. But if you love it as I do and are still worried about mercury in fish, just enjoy it in a recipe with lots of cilantro. That's interesting, though I am a little confused. Do you mean that cilantro gets rid of mercury? That sounds a little strange to me. Can you point me to some scientific literature on that? Well, I just have my friend's (acquaintance, really) word for it. Yes, the cilantro does rid your system of mercury according to her. She said it took about a year. If I find any supporting data I'll get back to you. In fact I shouldn't have posted without fact-checking, but I just found it intriguing and thought maybe others had heard of it. Sorry for posting so late but I just stumbled upon your article today! And am I so glad to read it! Tomorrow I'll go to the fish market and rekindle my long lost love of fish that was snuffed out by all those mercury stories......THANKS!! Helen, I just found this post of yours on mercury in fish a few weeks ago, and today, I found an interesting editorial in a local newspaper that you might appreciate. I think it complements your research rather well. Nonsense. Here the debate is wrongly framed as a choice between "avoiding" all fish (and in terms such as "sacrificing") or at best eating a variety of fish. Nowhere is a third way proposed, where one avoids fish high in mercury. The Harvard study makes clear this is the best choice. Another point: the FDA has not updated its mercury findings in more than a decade. They are aware that mercury in nearly every species is rising. The old levels you are referencing are nowhere near today's for most of the species on the list. i need info cause im doing a report is this a good site on mercury in fish???????? Think about it -- would I tell you that my site is a bad site? :) I am not a doctor or researcher, I am a cook. So, if I were you, I'd consider my site as a starting point and look at the studies that I reference. Particularly the third one listed in references. That one is done by Harvard Medical School and if anyone is a trusted source, they are. Interesting post, but I think you miss the point - The issue with mercury is not isolated to pregnancy as you seem to imply. It is a bio-accumulative toxin, hard (if not impossible) to get out of your system and harmful to you, not just your fetus. However, as several people have pointed out, only certain fish pose a serious risk here. It is simple to avoid them most of the time and eat them only on occasion, but irresponsible to imply that the risks are not significant or that these fish should be part of your diet on a regular (weekly) basis. I think we are in violent agreement here. With so many fish varieties on the market, I don't think I eat any fish on weekly basis even though I eat fish 3-4 times a week. But there is no medical evidence that I know of that ANY fish (even swordfish, tuna, shark, and tile fish) contain harmful amounts of mercury even if consumed once a week. If you know of such studies, please point me to them. Hi, its "anon" again. My point is that mercury is a bio-accumulative toxin. Any amount is too much. I still eat tuna and swordfish, believe me, but try to limit them to infrequent occasions and small portions. The way mercury works in the body, as I understand it, is actually the same way it ends up in those top-of-the-foodchain fish - the little bits add up over time. Since mercury accumulates in your tissues, even if you eat it infrequently, it builds up. The if you eat 20 swordfish steaks in a month, a year, or a lifetime, once they are eaten you will have the same amount of mercury in your system. That is what "persistent bio-accumulative toxin" means. That is why the pregnancy issue is a red herring (note the fish analogy!). Like I said, I still eat the stuff and enjoy it from time to time (espeically tuna!) but i try to limit it's place in my diet, thus (hopefully) avoiding any significant toxic buildup until I am in my golden years. Thanks for the great forum, Helen! I stumbled onto this post while looking up info on mercury in fish. What a great site you have! In terms of the mercury debate, I like the fact there are plenty of "clean" fish out there such as wild salmon, that we can go to without hesitation in place of tuna, marlin and shark. Interesting report, I agree that there is more to this issue than what the scaremongers tell us. One thing that hasn't been mentioned, though, is the fact that a lot of these 'high mercury' fishes are apex predators, vulnerable to fishing pressure and are often unsustainably harvested e.g. shark, marlin and many tuna species. So maybe the scaremongers are doing us a favour by steering the general public away from such species, even if not for the right reasons. A good site to check out is www.fishwise.org, they have a 'mercury list' on their website that lists all the species that have been tested to have low mercury levels, whilst being good options in terms of sustainable seafood. In retrospect, it seems that the Bible's instruction to eat only fish with scales may have some merit after all! The only more or less well-studied fish is a SWORDFISH (618 samples). The rest of the sampling is simply laughable and can be as low as 2 – TWO – samples. Randi! Thank you so much for the Selenium / Mercury article!!! Clinically we have been less concerned with fish as a mercury offender than other sources of contamination like amalgam dental fillings, immunizations and other industrial sources. Typically we use chelating agents that can be pretty harsh during the detoxification processes, never have we considered selenium. This could have great treatment potential for neurodegenerative "diseases" such as Parkinson's, Multiple Sclerosis, Muscular Dystrophy, ALS and Autism, in which Mercury seems to be an offender. Thank you so much!!! The research you did is interesting. I think it's important to be educated about what we eat, e.g. where it comes from, how it's produced, and what is in it. Thanks for taking the time to do the research. In a completely off topic note, you may want to delete the post above mine that is in chinese characters. It is a link to a site that people might find offensive, and certainly unrelated to this blog. Just thought you might want to know.